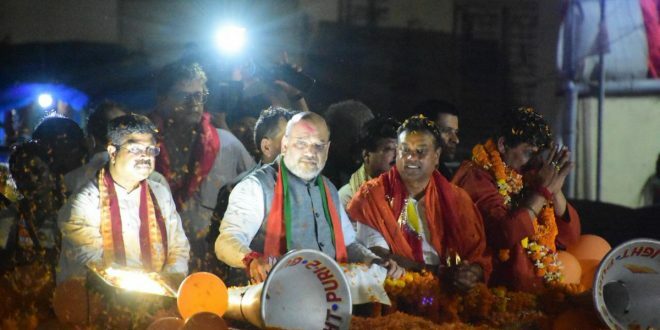 Bhubaneswar: BJP president Amit Shah participated in a roadshow in pilgrim town Puri on Tuesday. Thousands of BJP supporters joined in Shah’s roadshow, which began from Jagannath Temple and culminated at the Mausi Maa Temple. Voting in Puri Lok Sabha constituency and seven assembly segments falling under it is scheduled in the third phase on April 23. The BJP president was accompanied by senior leaders including Union Minister Dharmendra Pradhan, party’s national vice-president Baijayant Panda, Odisha in-charge Arun Singh and Bijoy Mohapatra. BJP’s Puri Lok Sabha candidate Sambit Patra also joined the roadshow.